Offensive topspin play at higher speed is your strategy. As a high level player you will take full advantage of the 47° sponge hardness for extra power and speed in your topspin play. 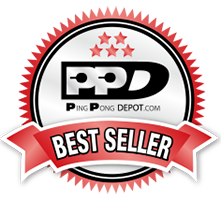 Now You are equipped to perform topspins with a precise curved trajectory and to be creative in the semi distance play as well. What's So Special About These New Rubbers? RASANTER is the most elaborate and complex rubber development ever undertaken in Germany. The goal was to develop a future-oriented rubber technology that allows all ambitious and technically skilled players to overcome the physical disadvantages of the 40+ ball. RASANTER's topsheet compensates for the rotational disadvantages of the 40+ ball, while the denser, ultra-thick sponge increases the catapult effect and compensates for the lower speed of the cell free ball. Rasant means fast in German. Rasanter, of course, means faster. So that gives you a hint of what these new rubbers promise. But the performance advantage goes far beyond just being faster. Let's explore this new technology in depth. What problem are these rubbers trying to solve? It's been almost 3 years since the changeover to the 40+ poly balls. These new balls are now the standard ball used in all sanctioned tournaments. Compared to the celluloid 40 ball that preceded it, the 40+ ball is about 0.5 mm larger in diameter on average. In addition, the poly material is slicker and smoother than celluloid. Combined, these two characteristics result in a loss of spin and speed when identical force is applied to a 40+ poly ball compared to the celluloid 40 ball. Ever since the switchover to poly balls, table tennis manufacturers have been trying to make up for that loss. andro has now done so with the introduction of their Rasanter series. But What Exactly Makes These New Rubbers So Much Better? First, let's take a look at the topsheet. andro engineers have significantly thinned down the topsheet to only 1.7 mm thick. This extremely thin profile, combined with a new pimple geometry, results in a larger contact area to provide a significant spin gain even at low impact speeds. Rasanter offers two topsheet versions: V (for Velocity) and R (for Rotation). The pimple geometry is the difference between these two. The V version has smaller pimples spaced farther apart than the R version, which has fatter pimples arranged more closely together. 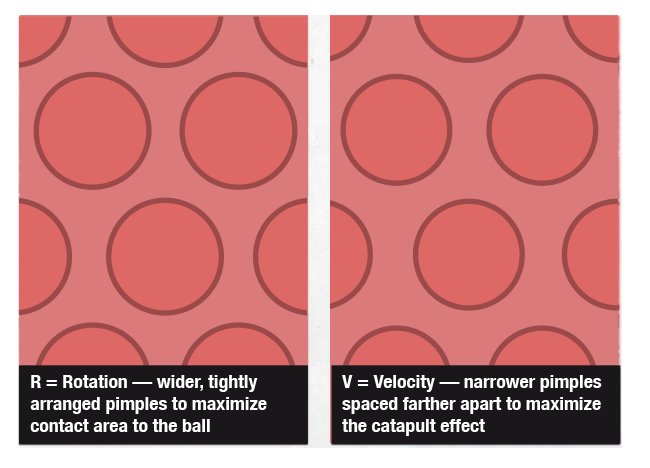 The V pimple geometry maximizes the catapult effect of the sponge, while the R version maximizes the contact area with the ball and allows for stronger surface tension. The topsheet's surface grip has also been enhanced. Still a grippy European-style top sheet, not a super-sticky Chinese-style topsheet. It has a glossy finish with superior grip to other European-style rubbers. Next, let's move on to the sponge layer. The sponge developed for Rasanter has a smaller cell structure compared to all other Tensor sponges. This results in a bigger catapult effect for a noticeable speed increase. In addition, by making the topsheet thinner, andro can make the sponge layer thicker. Their new Ultramax sponge is a luxuriously thick 2.3 mm, the thickest available. So smaller cell structure and denser, thicker sponge means more power potential. Andro offers their sponge in a variety of densities to suit virtually all attacking and all-round playing styles. The V version comes in 42 or 47 hardness sponge; whereas, the R version comes in 37, 42, 47, or 50. 37 is considered soft and is favored by players wanting to enhance the spin and control aspects of the rubber. 50 is a hard sponge and used by players with well-developed strokes who strike the ball with a lot of force and who emphasize power in their games. 42 is a medium sponge that provides more speed than 37 but retains excellent feel and control. 47 is medium hard and is favored by players who want the higher speed and extra power of a hard sponge but with more control than the 50 sponge. Combined, the topsheet and sponge are a marvel of table tennis engineering. The 2 topsheets and 4 sponges make it possible to ideally match one of these 6 rubbers to your playing style.